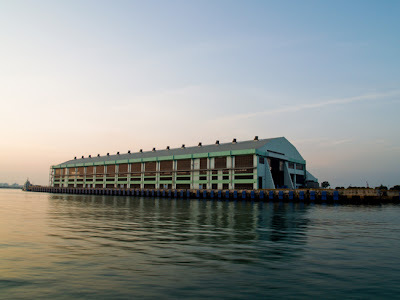 Was at Semakau with a couple of NParks dudes to collect mysid shrimp (they're not shrimps, they just look like one). 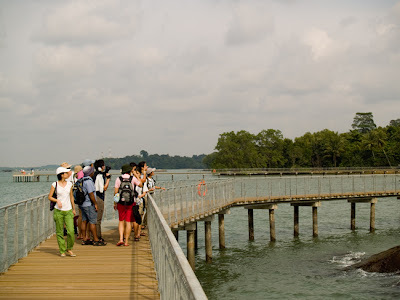 After the early boat ride to our rubbish dump island, we got to know that we had to walk all the way from the jetty to the shore. I was so used to that comfy van ride from the TSG trips that the walk seemed endless (look at the picture below for a guage). 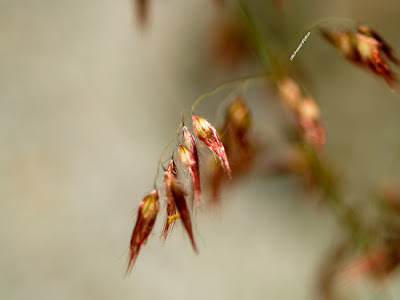 As usual, the vicious mozzies trailed us all the way from the forest till the seagrass meadow. Collecting mysid was kind of fun except for the fact that the tide is coming in fast and we need to work double time so that we can explore the place. We found 2 sea cucumbers and Robin decided to become a surgeon and took out a piece of sharp razor to cut off pieces of skin off one of them for studies. Apparently this procedure does not hurt them and surprisingly it didn't even eviscerate. 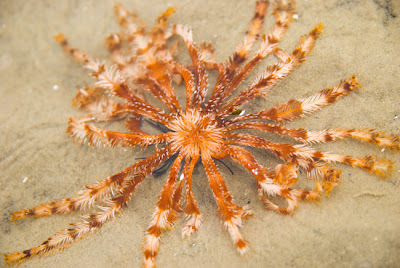 I went out further to check out the cliff but the tide didn't allow me entry so I checked out the corals there instead. There were quite a lot of large polyped stony corals and their colours were amazing, most of them probably extremely fluorescent. 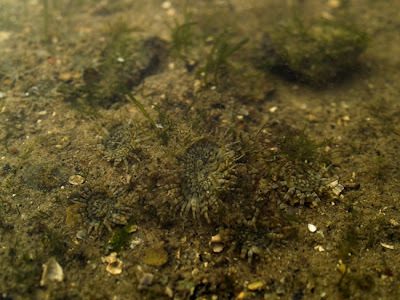 They looked healthy too compared to my previous trip there where I found quite a few with parasitic flatworms. 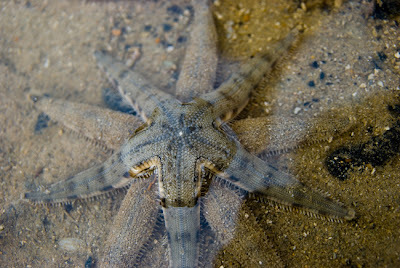 There was also a mass mating of sea stars and we soon got engrossed in all the activity. Robin was trying to figure out why the sea stars stack atop of each other during mating and the rest of us were just getting high seeing all the procreation going on. After we're done with the collection and the tide raging in like a flooding river, we quickly headed out and began on yet another long long walk to the jetty. 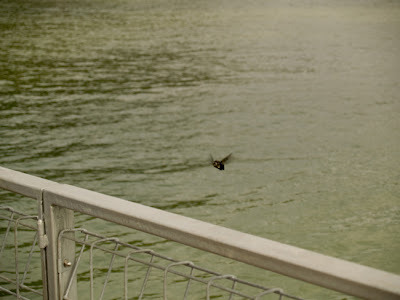 Maybe the heat was getting into us but while most of us slept while waiting for the boat to arrive, Wilson and Uncle Tay decided to catch dragonflies instead. And its back to the lab to assess what we collected. 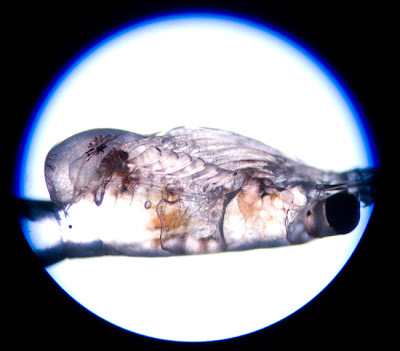 We weren't sure whether the shrimp like creatures we got were mysid because it was hard to tell by looking but the microscopy work proved us right! 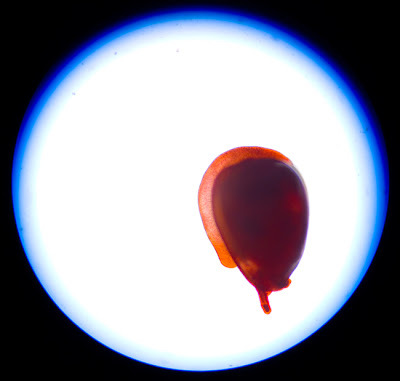 Mysid have that characteristic "pouch" called the marsupium which would carry eggs. They also look a little different from shrimp when viewed from the top. Another interesting find while collecting the mysid was this strange bright orange gastropod which appeared in mass. We've never seen it before, anyone knows what it is? 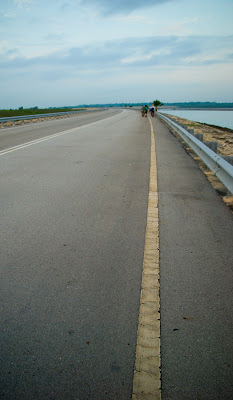 And lastly, this was being cultured by us, not collected from Semakau. 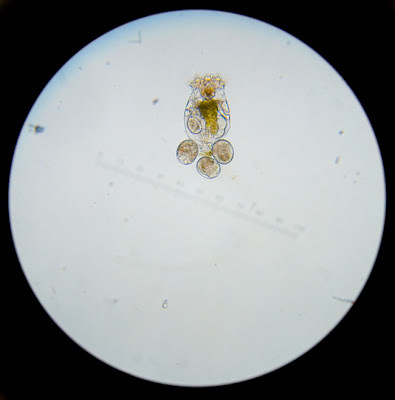 This is a rotifer, strange looking creature isn't it? Was at CJ early last Thursday morning helping Kok Sheng with his project on the CJ mass death incident. 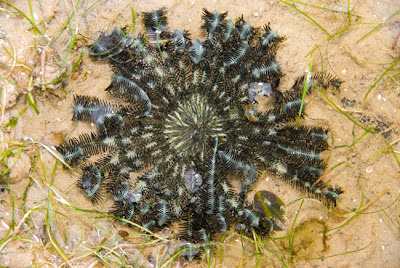 I'm supposed to do a survey on the sand dollars together with Robert and gosh was it a lot of work! 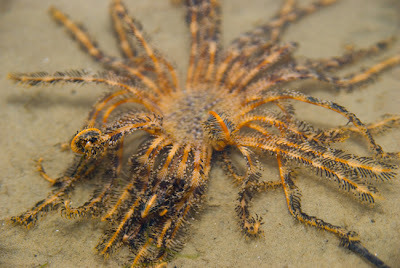 So while the both of us were digging our hands into the sand to scoop up the sand dollars, I did manage to catch some interesting creatures that roamed the shore that breezy morning. 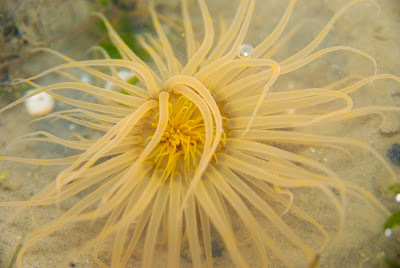 Almost immediately, one would spot these gorgeous peacock anemones and they come in all imaginable colours. There's more to come later so keep checking back!! Hey so you've seen what a typical work day for the seagrassers are like so now's for the fun part: after the transect! So what DO we do after getting down and dirty in the mud? Well, we chill out at the newly renovated No. 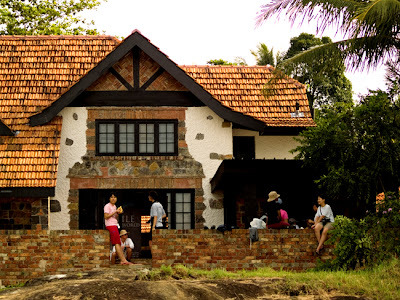 1 house! Ria brought some ham, raisin bread, 100 plus and not to forget some funky seafood spread (everything is really nice if you don't mix them together). 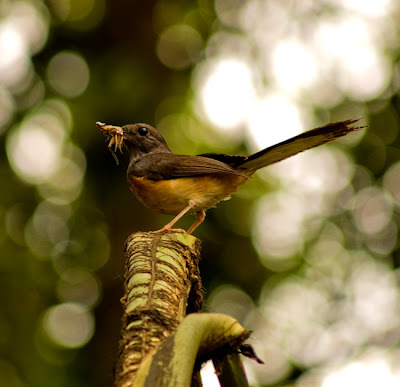 On our return from the shore to the wash area, some of us caught sight of this cool bird that sung a lovely serenade with a cricket in its beak. Impressive isn't it! 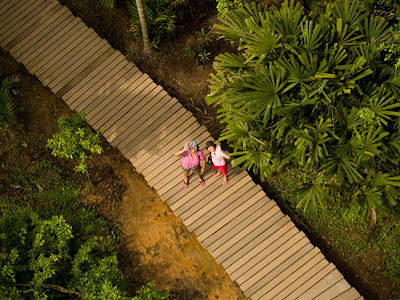 So after eating and resting and chatting, we finally got our lazy bums up for a guided boardwalk on the newly constructed erm, boardwalk. And just as we're about to leave No. 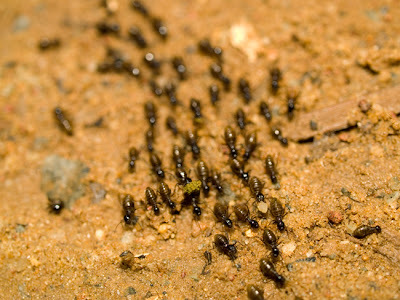 1 house, there's a bunch of termites leaving their home too. Now, all geared up with our photography equipment (you'd be surprised at the gear we have), the avid seagrassers went back out to the shore, this time all high and dry. 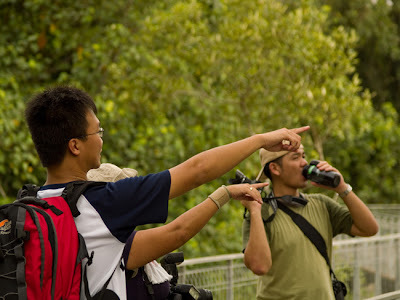 Cheng Puay was also busy showing us all the interesting plants along the way. 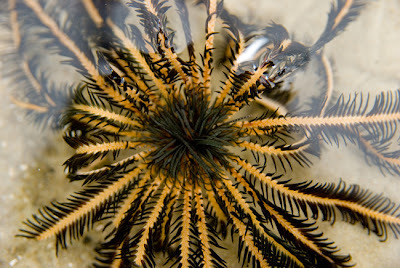 It seems most of them are commonly called "Sea - something" depending on their resemblance to other plants. There's the Sea Nutmeg, the Sea Hibiscus, etc. Another attraction of the boardwalk is this very tall observation tower that allows you to have a panoramic view of CJ. 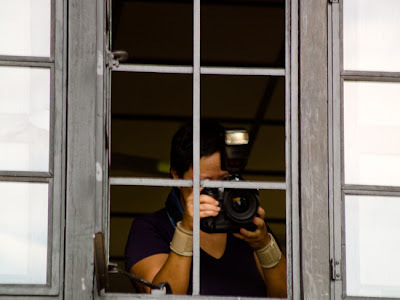 Here's Dionne taking photos after a futile search for eagles. Not all seagrassers were as gung ho to climb up the stairs of the observation tower. Some just preferred to stay at ground level. 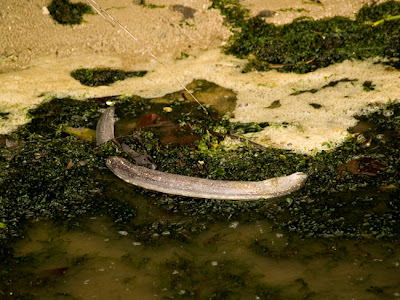 Nearing the end of the boardwalk, we spotted this dead eel. 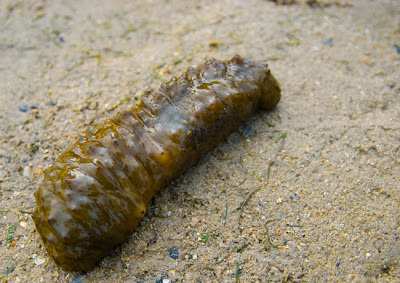 Did it get stranded amongst the dense algae? Oh and we met James who was also photographing at the boardwalk. 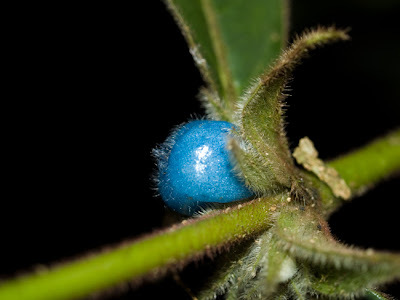 Cheng Puay is trying to get a positive identification for this strange blue fruit. Its amazing what you can find if you look hard enough. 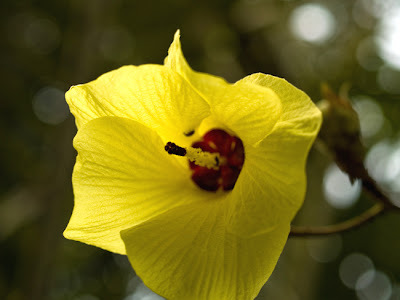 And lastly, this is how the flower of the Sea Hibiscus looks like. Really neat stuff! 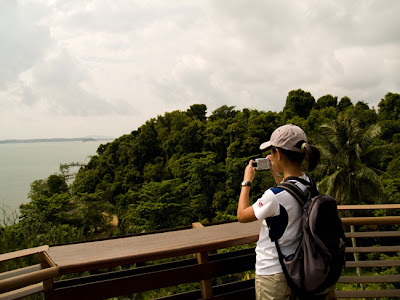 Its been a long long time since I blogged because I went away to Sabah on a conservation project with Sijie. Anyway, today's blog is going to be a Special Edition entry for TSG. For those who somehow got to read my blog and wondering what it is like to be a seagrasser, I'm going to present you "A day in the life of a seagrasser". 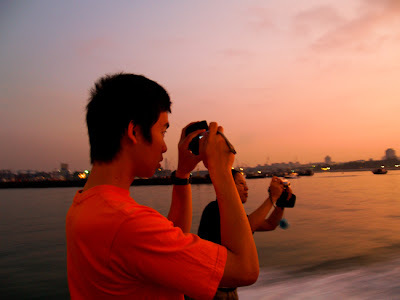 Firstly, depending on the tide times, we get up really really early in the morning to proceed to our destination for monitoring. Usually we're all blur and grumpy but the spectacular sunrise never fails to uplift our spirits! Then it's rush hour to get down and out with the monitoring as we only have a time frame to work before the water comes back in and floods the whole shore. We'll start off by laying the 50m transect tape so that we know where to place the quadrats. 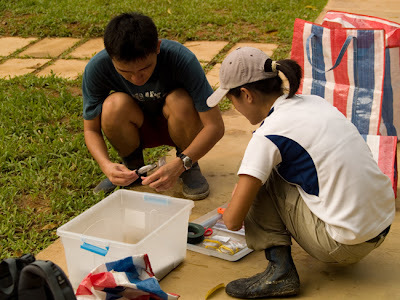 Once that's done, the teams would check each quadrat position for things like seagrass coverage, algae coverage, etc. 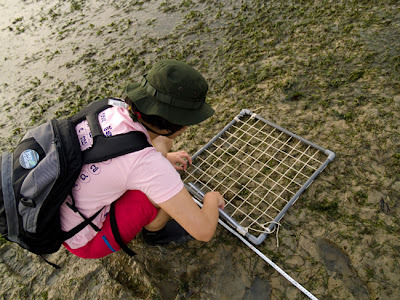 Here's Nor Aishah measuring the canopy height of Cymodocea rotundata which is the length of the seagrass itself. 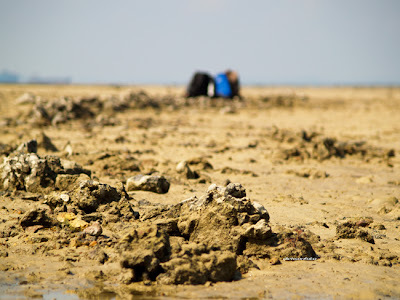 I noticed that for Chek Jawa, we usually forget about the rocks around the boardwalk so I decided to take a look today and saw these rock anemones. The team also spotted a juvenile monitor lizard around the rocks. So after the tide rises and we evacuate the area, it's time to head to the wash area to wash the equipment and ourselves up. 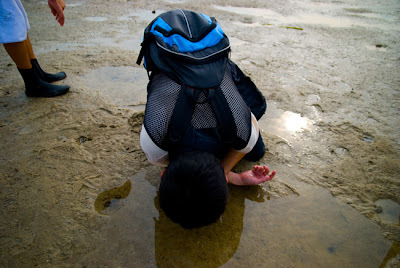 Then it's also checking to see that none of us left a compass in our pocket or the data sheet tucked in our pants. And after that usually we'll either head for some food or go straight home if we're tired. 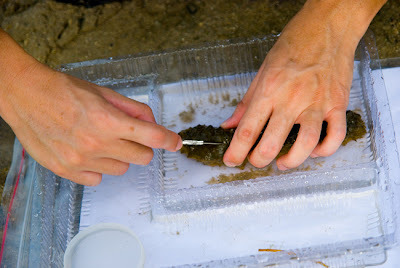 Stay tuned for a part 2 of what we did after the transect at CJ! 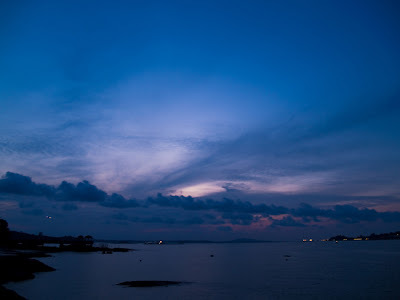 Its very saddening to receive news on the doomed Sentosa shore. Especially for me, I might not have a chance to visit it again as the NHC trips are scheduled right smack in the middle of my test week. 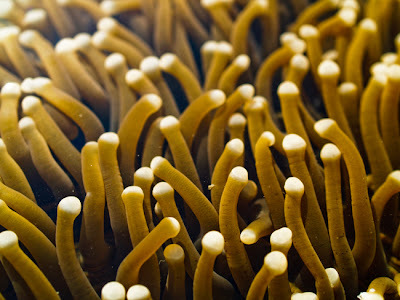 Looking at the giant Euphyllia sp., the sponges, the critters, it really brings to me the issue of sustainable development. I always had this notion that one day, we'll reach a point of environmental crisis and its already too late for anything to be done. Our environment is always on the bottom of a priority list and this itself, is like a drug, the more we try to ignore it, the worser it'll come back to us. This year marks a milestone for everyone for it is this year that we finally experience the "Doomsday Effect" that was predicted but tucked under the rug as a piece of nonsense. With rains coming in the dry months, freakish weather and even unpredictable tides, I don't know what more must we see before it strikes each and every one of us that our Earth is ill.
Its a dilemma I know, that our country dreams of earning a little extra pocket money and at the same time, face with nosey volunteers coming up to foil their plans. 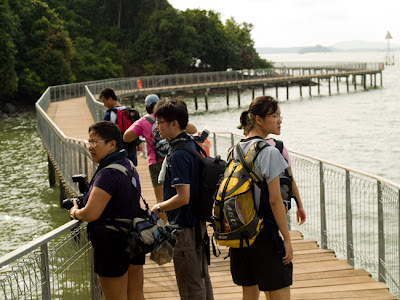 When will these people understand that there would never be an end to competition, to development, to wealth while places like Sentosa's shore faces the gallows? 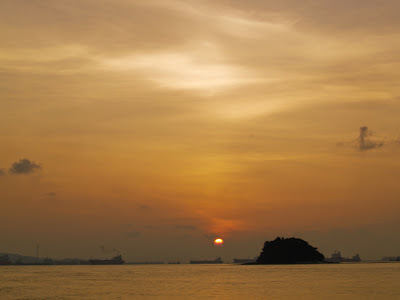 Its overdue time for us to take a LONG HARD LOOK at ourselves and think, would you really want Sentosa to forever carry the stigma of being Pulau Blakang Mati? 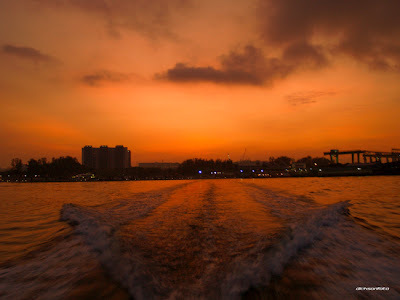 It was a blazing morning as the sun revealed itself in a majestic manner, firing up the sky a deep orange red which finally simmered down to a cloudy brown as we passed Pulau Jong to reach Pulau Semakau. The avid seagrassers were also busy with shooting this wonderful sunrise, a good omen for the day ahead perhaps? 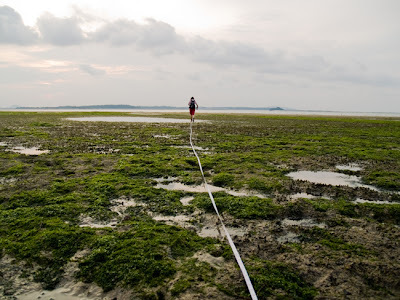 This trip would mark my second time here at Semakau and I'm very very excited to visit the large seagrass meadow and the reef edge there. 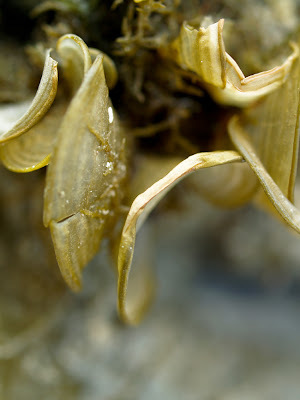 After doing the transect, its exploring time again and this time, armed with a new 35mm Macro lens, I went to peer closer at what actually lies in our waters. 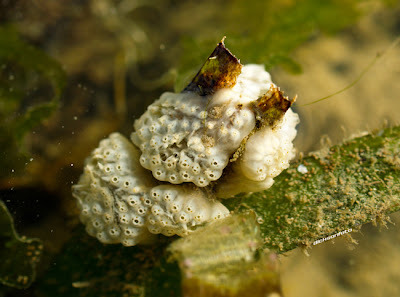 On the seagrass, there were many sponge-like "growths" which are actually ascidians or more commonly called sea squirts. These cute fellas come in all shapes, sizes and colours and some are even solitary (these here are colonial). 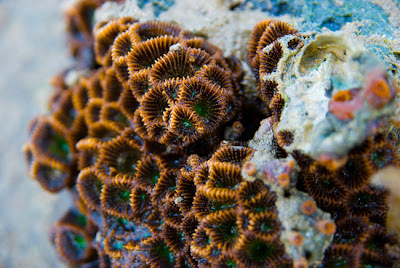 The corals there look healthy too and some of them are just HUGE. I'm still looking out for those pink porites which I think are pink due to a pigment they produce to shield them from the sun's UV rays. 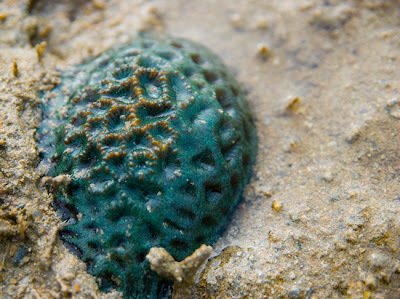 Scattered around the intertidal zone are numerous sponges that may resemble the stony corals seen there except that they are soft. 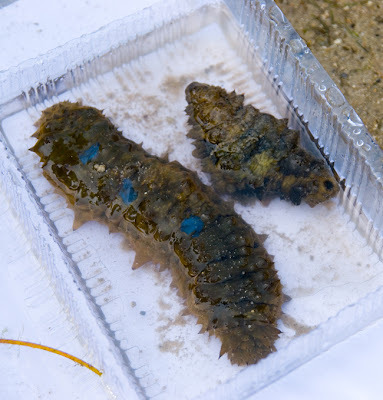 These guys actually get their nutrition from particulate matter in the water column and they do that by sucking in water from small pores called ostia and filtering the water with tiny hairs in their main body. 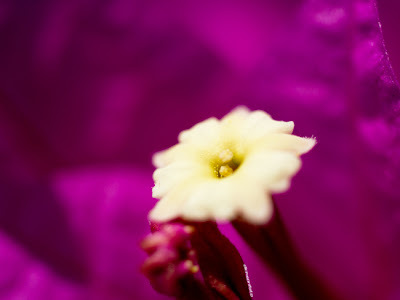 The water is then expelled out from a bigger opening called the oscula. Interesting isn't it! While treading back to collect my transect tape and bag, I chanced upon this Heliofungia sp. 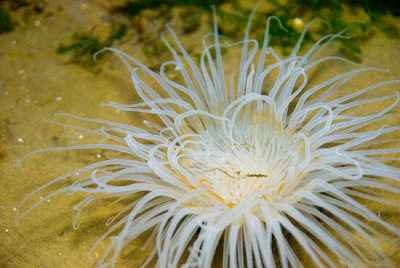 which looks like an anemone. 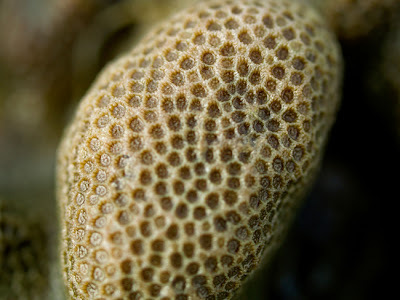 These corals, although the uncanny similarities to anemones, belong to a totally different group of corals as they build a calcium carbonate skeleton whereby the anemone does not. Other than the animals there, the algaes are also quite interesting if you look at them closer. 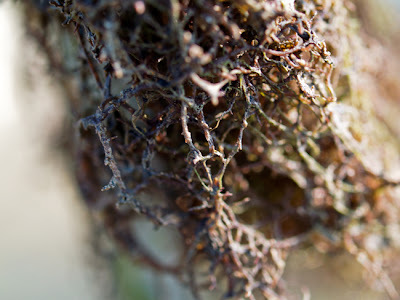 This purplish, stringy algae was found on the stake marking the transect area. Looks a bit like the "fa cai" that Chinese people eat during the New Year. Further up after the seagrass meadow, I found quite a few Halimeda sp. 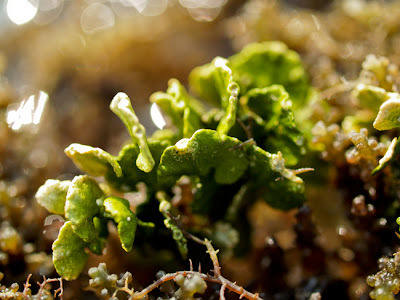 which are a special type of algae that incorporate calcium into their tissues. These algaes are crucial for reefs as they provide a substrate for the many organisms to grow on. 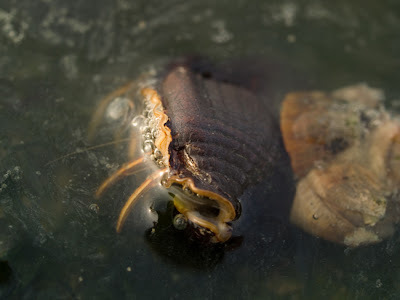 Near my transect site, I spotted this horseshoe crab moult. 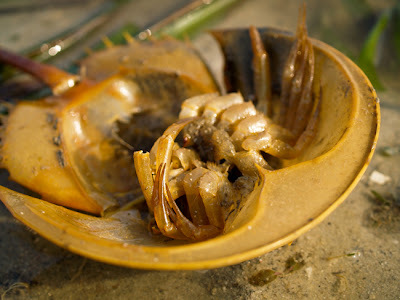 I didn't know horseshoe crab moults are actually orange in colour as they usually are green. I'm also quite amazed by the seemingly perfect symmetry in the shell. 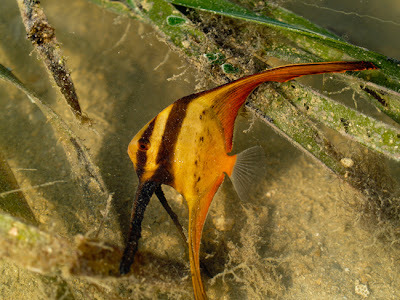 Helen found this little Batfish amongst some seagrass. This guy was just about palm size and could grow up to bigger than my head when it matures. The adults are usually darker in colour and their fins might also develop streamers. As noon approaches, the weather started to turn scorching hot! Some of us couldn't take the heat and rested in the shade while waiting for the others to be done with their exploring. Ironically, this parched land would soon be engulfed by the incoming tide. 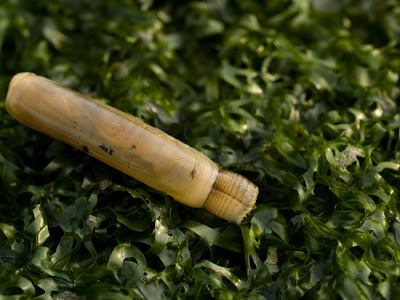 Besides the watery wonders, there are also nice finds on land too. 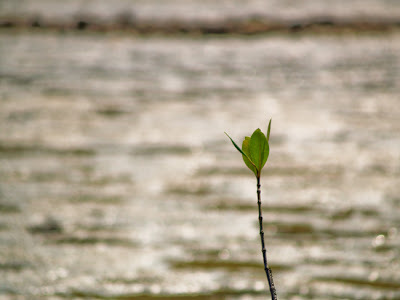 I noticed that there were many mangrove seedlings growing. Hopefully, when I return in the future, they would have grown into trees. 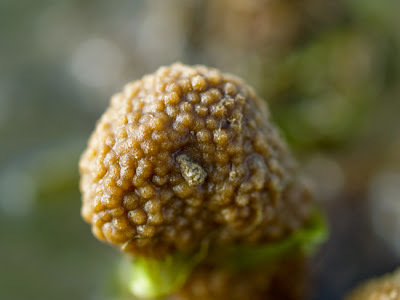 This strange looking plant actually has hairy fruits!